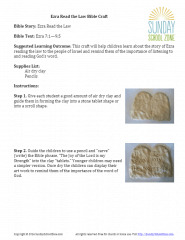 This craft will help children learn about the story of Ezra reading the law to the people of Israel after their return from exile. 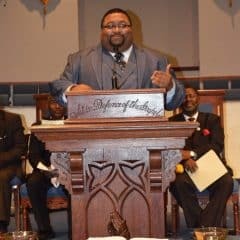 As they learn about the story, it will remind them of the importance of listening to and reading God’s Word, the Bible. Step 1. 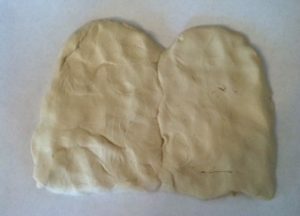 Give each student a good amount of air dry clay and guide them in forming the clay into a stone tablet shape or into a scroll shape. Step 2. 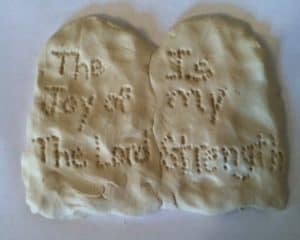 Guide the children to use a pencil and “carve” (write) the Bible phrase, “The Joy of the Lord is my Strength” into the clay “tablets.” Younger children may need a simpler version. 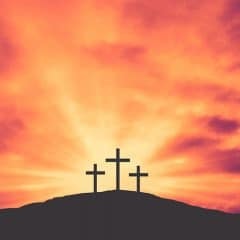 Once dry the children can display their art work to remind them of the importance of the word of God.